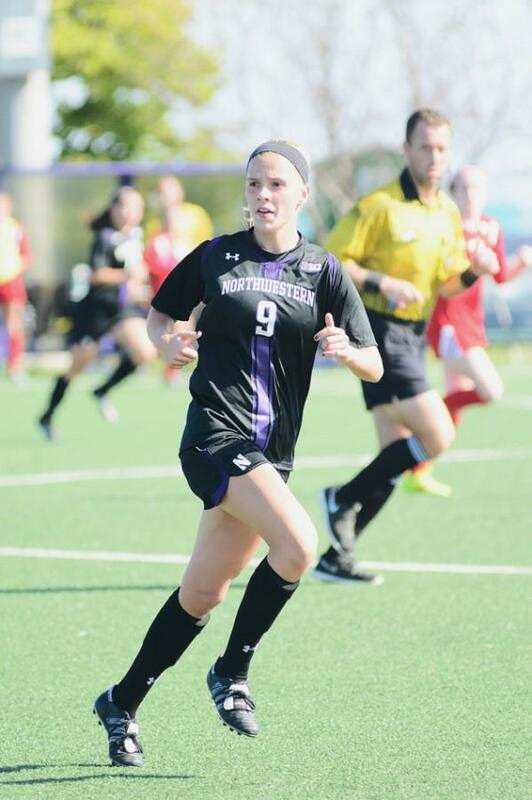 Junior Niki Sebo took three shots in Northwestern’s 2-0 loss to Ohio State. The midfielder was one of several Wildcats players to create offensive opportunities but fail to score. Northwestern suffered a frustrating loss against Big Ten powerhouse Wisconsin on Sunday afternoon. The Wildcats (5-7-2, 1-6-1) looked to secure their second conference win but could not deliver against the tough opponent. The Badgers (12-2-1, 6-2-1) have one of the best records in the Big Ten, with losses only to top teams Penn State and Michigan. The Cats’ motivation remains to climb from the bottom and gain eligibility to the conference tournament. Freshman goalie Lauren Clem and the NU defense only allowed two shots on goal in the first half, with one resulting in a goal. Despite the lack of shots on goal, the Badgers started off strong, with Cara Walls scoring off Kinley McNicoll’s corner kick in the 17th minute of the game. It was McNicoll’s seventh assist of the season. Wisconsin got to the goal again in the 68th minute through a free kick by McNicoll from 30 yards out. The end result was a score of 2-0 for Wisconsin. The Cats had a great offensive showing, even though they remained unable to convert these shots into points throughout the game. There were a number of offensive opportunities by junior Niki Sebo (three shots), sophomore Addie Steiner (eight) and freshman Maria Fayeulle (four) that had the opportunity to result in a conversion for the Cats but failed to get points on the board. The closest the Cats came to scoring was a shot by Fayeulle in the second half that barely missed, hitting the crossbar. “When people talk about soccer being a cruel game, this is one of those days where you feel like you did everything right,” coach Michael Moynihan said. The Cats had the advantage in the second half and kept a majority of play on the Wisconsin side of the field, creating a lot of opportunities for scoring. Wisconsin leads the league in shutouts and added to their shutout record, which now totals 11. However, Badgers goalkeeper Genevieve Richard got immense pressure at the goal Sunday from NU’s offense. She had 10 saves for the day compared to an average of 3.2 saves per game, as the Cats were successful penetrating the stout Badgers back line. It was the first time this season that Richard made double digit saves. The Cats defense had an impressive showing Sunday, severely limiting the number of shots the Badgers were able to take on Clem. Despite the limited shots taken, the Badgers delivered and scored twice. NU more than doubled the Badgers in shots taken, 20-8, but were still unable to convert. The Cats travel for their next two games to face Maryland on Friday and Rutgers on Sunday.